Many of you know that the 35th Ave NE repaving project is about to change how 35th Ave NE flows. What is certain in the Seattle Department of Transportation’s design is the addition of a protected bike lane(s). The channelization of 35th Ave NE will move parking to the east side of the street and remove the alternating rush hour parking restrictions currently in place on the east and west sides between NE 65th St and NE 85th St. The WCC had a preliminary meeting with the Seattle Department of Transportation (SDOT) yesterday to discuss what the channelization means to our community and the goal of the 10/21 public meeting. The SDOT Public Meeting and Walking Tour will be held Saturday October 21st, 10 a.m. at the Messiah Lutheran Church, 7050 35th Ave NE. The meeting will begin with a brief open house where attendees will be able to review project boards and ask some 1-on-1 questions. There will also be a presentation with greater detail on the project, including what the flow will look like for improving safety of our pedestrians and cyclists. After the presentation there will be a public Q&A session with SDOT, Environmental lead, and potentially our D4 Councilmember Rob Johnson. We would hope that the decorum of the meeting can be productive and not a shouting match of competing personalities. From 11:30 a.m.-12:30 p.m. those who would like to go on the walking tour will break up into groups and visit either NE 75th St & 35th Ave NE or NE 65th St & 35th Ave NE. Leading up to this meeting SDOT will be sending out targeted postal mail regarding the meeting. The boundaries of this mailer are NE 95th St to the north, NE 45th ST to the south, 40th Ave NE to the east, and 25th Ave NE to the west. So Keep an eye on your mailbox. There are victories (albeit smaller) to celebrate regarding this project. There will be crosswalk improvements at NE 89th St which will include more painted crosswalks and an additional light to help those crossing. Your Voice Your Choice results will bring a marked crossing at NE 80th St, with Rapid Flashing Beacons similar to the crossing at the Northeast Branch Library at 6801 35th Ave NE. After multiple years of asking, we are getting dedicated turn pockets at the intersection of NE 75th St and 35th Ave NE, in both northbound and southbound directions. There will be no curb bulbs added in this project. There will be better protection added to the trestle where the Burke Gilman Trail crosses over NE 45th Place. The project design phase is at 90% completion so there is little that can be done to drastically alter the design. There will be 3 Speed and Volume studies done after the completion of the project. 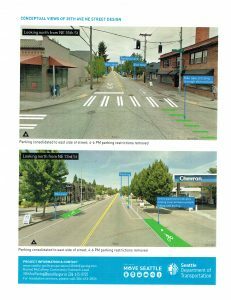 They will review the timing on the light cycles at NE 75th. We did ask for them to consider adjusting the signal timing for all of the signals in the boundaries of this project. We know that there are some who are not in favor of the way SDOT is improving the way 35th Ave NE functions, but the sad reality of this project is that if no safety improvements are done it will only be a matter of time when a speeding car passes on the right and takes out a pedestrian. Slowing the speeds is a help and even though we advocated for better pedestrian improvements this project will help to streamline a very dangerous street at rush hour. The WCC is going to stay focused on working through the changes and continue to provide SDOT with our community’s concerns regarding dump out traffic and other changes to our side streets. So now there will be no street parking available for library patrons along 35th unless you want to park on the east side and risk crossing the street! Doesn’t make a lot of sense and will even cause slower 35th travel time thru this area as the cross walk will have increased use. Plus I haven’t heard of any sidewalk users getting run down by cars jumping the curbs around here: justifying something based on scare tactics is pretty lame in my book. Thank you for your comment. Please consider joining us on Halloween and people watch at the intersections of NE 75th St or NE 85th street. The resources I referenced to arrive at the conclusions of a potential pedestrian fatality are from the 2016 SDOT safety report pages 25 & 51. That is correct. There will be no parking on the west side of 35th ave NE from 65th to 85th. Your comment is somewhat confounding: on the one hand, you are sufficiently afraid of crossing 35th that you don’t want to park on the east side to get to the library, but then you consider traffic calming for pedestrian safety to be a “scare tactic.” I am sure that you will find that the updated crossing will be safer with shorter effective crossing distances and better sight lines, especially with the rapid flash beacon at 68th. Can you elaborate on what options are on the table for limiting cut-through traffic on side streets? When you say they will “review light timing cycles” does that include removing the need for pedestrian “beg button” use during all or some of the day? Has there been any discussion about improving bus efficiency along this corridor especially after the re-channelization? I am very disappointed that parking remains on this entire stretch (even where there are no businesses), but the southbound bike lane turns to “sharrows” at 65th, which most planners have realized is a worthless (or worse) piece of bicycle infrastructure. So much for listening to the many public comments demanding safe connections to the burke from a neighborhood where 37% say that they get around by bike, and 48% would like to get around by bike (those numbers are from the SDOT survey responses for this project). Additionally with all the concerns about traffic flow, I am sure that cars pulling in and out of parking will be a major contributor to congestion. I know your post said that at 90% design completion it’s hard to change the design, but SDOT seems to have settled on a compromise that appears as good “output”, but pays lip service to their public feedback and will have little positive outcome for anyone: more miles of disconnected bike lanes, and more arterials that prioritize private vehicle storage. At least there will be some pedestrian safety improvements, but without curb bulbs those too seem like a lucky side-effect and the bare minimum. Hi Liam. Thank you for your comments. The options possible on table are most likely post project. Perhaps we utilize programs like safe routes to schools or traffic calming solutions yet to be explored depending on neighborhokd needs. SDOT has committed to 3 post project traffic studies. They did not identify which streets those studies would talk place, yet our hopes are they choose some side streets to really evalute this projects impact. For the suggestions of light timings I did ask that they sequence the lights for a speed. For example people getting the light say at 45th place would in theory get a green light all the way through to 95th. Now that is not certain SDOT will do that yet there are other cities like DC that the light timing is set for 30mph and traffic moves pretty well. There will be timing changes made to NE 75th St when the turnpockets are completed. As far as pedstrian call button changes that was not discussed. One part of the descision made by SDOT to move the bike lanes to the east side of 35th was the bike communities input. The idea is that its better to be in a protected lane on the incline than to be protected on the decline. There will be bike lane connections sooner than you think with the Fix 65th campaign in Ravenna. They are exploring bikelanes all the way from 35th to Roosevelt. The bus frequencies are going to increase in the next year. SDOT will be potentially be removing stops that have lower boardings than others to improve the timliness and prevent too many stops along 35th. Feel free to reply here or info@wedgwoodcc.org if you have further questions. I am against adding bike lanes to 35th ave NE through Wedgwood. Why not use 39th? If reduced speed for cars is the goal then increase tickets using camera technology until people slow down. Does anyone have good data on the amount of bike usage in our area for commuting and for recreation use? I see few cyclists and bottlenecks at varies intersections for example at Roosevelt and 45th and all along east lake. I see little bike usage on 15th NE past Northgate. I’ve participated in meetings and surveys and don’t understand how the bike lobbyists got have such influence on this plan. Does the data support this? According to the information given at the meeting, there is no available information on bike usage along 35th. SDOT feel that to be balanced they can go by who filled out a survey, which can clearly be swayed either way with the right PR about said survey. I’ve been waiting for this for almost 30 years, and support any safe infrastructure the Seattle Department of Transportation can pull together. I gave up regular bicycle commuting when traffic increased exponentially, and promised myself that I wouldn’t commute again until protected lanes were installed around the city. Just because drivers might not “see” many bicyclists doesn’t mean there won’t be any. Many like me are eager to return to, or begin, bicycling and feel protected from car traffic. Amsterdam is a good example. My “Field of Dreams” is this- if you build it, they will ride. Today, 35th Avenue NE; tomorrow, the city. Robin, thank you, I appreciate your comment about protected bike lanes. My concern is that bus service continues to be unreliable, lane for cars are diminishing and many people are unable to use bikes as a necessary means of transportation. I also have experienced many cyclists who bike very unsafely in bike lanes. One example is the parking garage at Trader Joe’s, There was a close call with a cyclist who speeded past as Someone was turning into the garage. There already is a bike Ave 4 blocks away on 39 Ave. It is built aready. Where are the riders? I commute through the area by bike. I do often take 39th, which is great for stopping by the PCC or Met Market. I also ride on a fairly quiet route on 30th or even via Ravenna or 20th. My daughter’s dance class is on 35th as is her pre-school. So is the library, several grocery stores, some local pubs and restaurants. Our family bike rides almost always bypass one of our nearest neighborhoods (35th) to go to the U District, U Village, Lake Forrest Park, the Sand Point area or even Fremont or Ballard. I was impressed with the number of bikes and families at Mod Pizza last weekend. While we were there we made a stop at Third Place Books and made a hardware run. I do get groceries by bus sometimes, and the tiny sliver of sidewalk between the parking lots and the bus stop on 35th and 85th is terrifying when you have a bag of groceries in one hand and a toddler in the other. Even crossing the street with a person using a walker and a toddler to get fish and chips requires a lot of trust in the attention of our neighbors who are driving. We are a one car family, so we also drive through 35th a lot. I get impatient and am tempted to pass on the right. But I’ve learned the time savings are purely an illusion and the risk to lives is real. I like parking close to the door when I’m driving (often with passengers), which is why I’m always excited to provide others who aren’t driving a way to walk, bus or bike safely and leave the parking spaces for those who really do need to drive for whatever reason. The city has done a great job increasing the service frequency and reliability of the 65 bus in the last few years and it has made a real difference. With the light rail opening not too far away and improved biking options, a lot of families in the area will be choosing to live with one car. Let’s be welcoming to that. Hello. I appreciate sdot making these improvements, however 35th Ave Ne is dangerous and extremely congested between 95th and 125th. I bought a house on 35th Ave Ne over 5 years ago and see it on a daily basis. There are people ie… kids, commuters, people with mobility issues needing to cross 35th and vehicles drive way too fast. There needs to be an overhead flasher system at the corner of 120th and 35th. 3 years ago I became wheelchair bound and struggle everytime I try and cross the street to catch a bus and/or walking my dog. As well…. the sidewalks from 125th all the way up to 95th are mostly not compatible for wheelchair traveling due to large cracks in the sidewalk – tree roots that have pushed the sidewalks up in some spots by 4 to 5 inches – nonexistent ramps from sidewalks to get across to the next stretch of sidewalk. 35th Ave NE is extremely congested along the entire proposed distance–from 47th to 89th. They are planning to make intersection along this corridor compliant with ADA ramp standards. Your street doesn’t seem to be part of this plan. I can not ride a bike and I have to use my car regularly on 35th. I am against the proposed bike lanes which will increase the congestion of car traffic. Is there any study on the number of cars versus number of bikes using the 35th? Were there a lot of accidents involving bike riders on 35th? Adding more bike lanes will not discourage car usage for majority of the people because of many reasons such as people’s age, rain, need to buy groceries, transporting kids around, etc. How come city is using my tax dollars in favor of bikers who does not even have licences and don’t pay any licence fees. Also I am not buying all the talk about pedestrian safety. If city wants to improve pedestrian safety why don’t they install sidewalks on the streets. There are many streets without a sidewalk such as 95th street and most part of Sandpoint way. I think city is waisting enough money already.